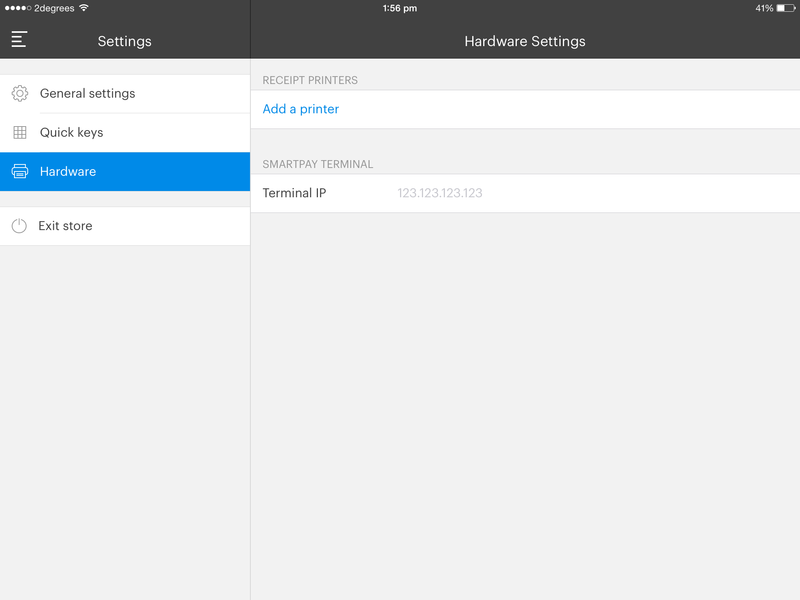 Setting up Vend on iPad – How can we help? The Vend Register app is the Vend app for iPad. It's been specially designed to be quick and easy for retailers to use. 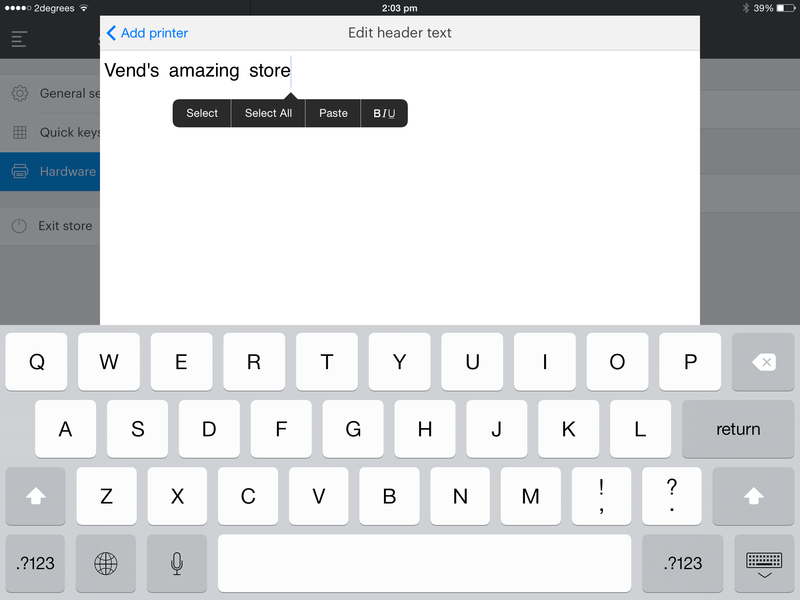 To learn how to use Vend on iPad, check out this article. What happens if I change/delete a quick key product? These minimum requirements are in place because older iPads, and older versions of iOS may be too slow or are missing some of the features required for the Vend Register app. If you plan to use Vend's Gift Card feature, you'll need to enable it through the web version of Vend first. This can be done by accessing Vend on a computer or from Safari on your iPad. To learn more on this, click here. Remember – we're introducing new features to the app almost every week so keep an eye out for the latest app updates. You can do this by following our blog, our Facebook page or our Twitter. You can download the Vend Register app from the Apple App store on your iPad or just search for Vend Register. You'll need to spend a little bit of time setting up Vend on iPad before you start using it. Important: Only administrators and managers can set up the Vend Register app. If you are a cashier, please speak to your manager or administrator. Select the register you would like to use. 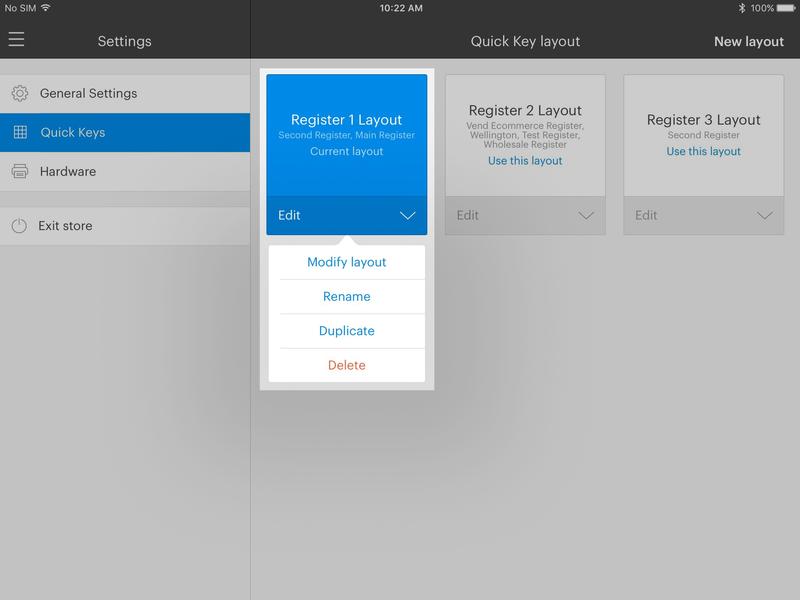 Important: Quick Key layouts can only be created and modified when you are online. Quick Keys are managed using templates. You can create multiple templates, giving you the flexibility to optimise layouts for different stores, as well as for different occasions such as big sale times. Click the menu button on the top left of the Vend Register app to open the sidebar. From the sidebar, Choose "Settings" and select 'Quick Keys'. Tip: This layout can be accessed across all registers in all stores, so make the layout name specific if need be. Make sure you are signed into the correct register on the Vend Register app. Once a template is set up, you can duplicate it, making minor tweaks and optimisation a breeze. Tap the drop-down menu and select 'rename' to rename the new template. If you are no longer using a Quick Key template, it can be deleted, provided you are not using it on another register. Find the layout you want to delete. Tap the 'Edit' drop-down menu. Find the template you want to add Quick Keys to. Tap the 'Edit' drop-down menu and select 'Modify layout'. In the search field on the left, search for your product. You can search by name, handle, SKU, or product tag. This search will display any single products, composite products, and the parent product for variants in your search. You can also scan the product barcode to find it. The product will appear on your quick key template. Note: Individual variants cannot be set up as a separate key. These are accessed using the same key on the sell screen. You can have more than one page of quick keys - there is no maximum number! Swipe left to access the next page. You can also move products you have already added to a new page. Press and hold the product, and drag it to the edge of the layout. The next page will appear. Press and hold the quick key or folder. A grey bar will appear on the left-hand side of the screen. Drag the key to this bar. If you have added a product to a folder, but you want to move it back to the main screen, you will need to delete it from the folder and re-add it on the main screen. Choose the colour. This can be helpful for categorising products, so it's easier for your staff to find them. Note: These changes will be saved automatically. You also able to group quick keys together into a folder. To do this, tap and hold a product and then drag it on top of the product you would like to group it with. This will create a folder. You can then tap and hold any other product and drag it on top of the folder to add it. Alternatively, tap the folder to open it, and use the search bar to find the products you want to add. Each folder can be renamed or changed colour by tapping the folder to open, and then tapping the pencil in the top left corner. Tip: You can decide whether you would like to leave this folder open after selecting a quick key from it. This can be useful if you often add multiple products from a single folder into a sale. Your quick keys are regularly synchronised with our servers. If you add new variants to a product or change prices or other details, these will update the next time your quick keys sync. If you change a product to 'inactive' in the web app, the next time your quick keys sync, the key will be greyed out. If the product is permanently inactive, you may like to remove this key from your template, by editing the quick key layout. When you delete a product from your store, the next time your quick keys sync, the product will automatically be removed from your quick key template. If you would like the updates to apply immediately, you can manually sync your quick keys. Click the menu button. Tap the status near the top of the sidebar. This will open the sync statuses - click 'Sync all data' to start a manual synchronisation. If you'd like to use a barcode scanner, you can use the Socket Bluetooth Barcode 7Ci Scanner. Important: this app does not support barcode camera scanning/ Infinea scanners. Register enables you to set up multiple printers for each store and to print from multiple iPads to these printers. 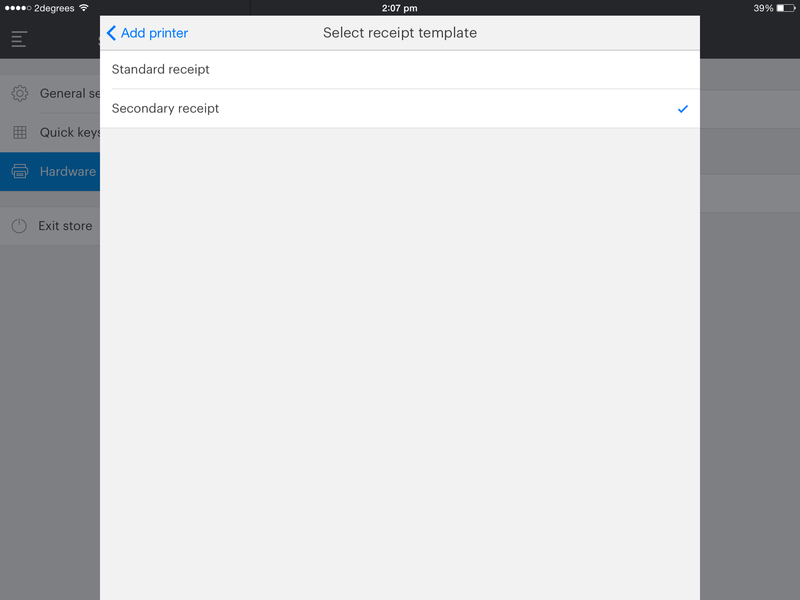 You can also set up split printing, where an additional receipt prints for certain items. This may be useful for printing a barista slip, for example. Star TSP 100 LAN series - suitable for use in a store with a WiFi network. Star TSP 650 series- suitable for use in a store with a WiFi network (Ethernet connection to router) or via Bluetooth. Star SM-S200i - suitable for mobile stores with no WiFi network. This printer connects via Bluetooth. Epson Printers - require configuration on a desktop or laptop computer before use with Register app. Epson TM-T88V - suitable for use in a store with a WiFi network. Epson TM-T82II - suitable for use in a store with a WiFi network. 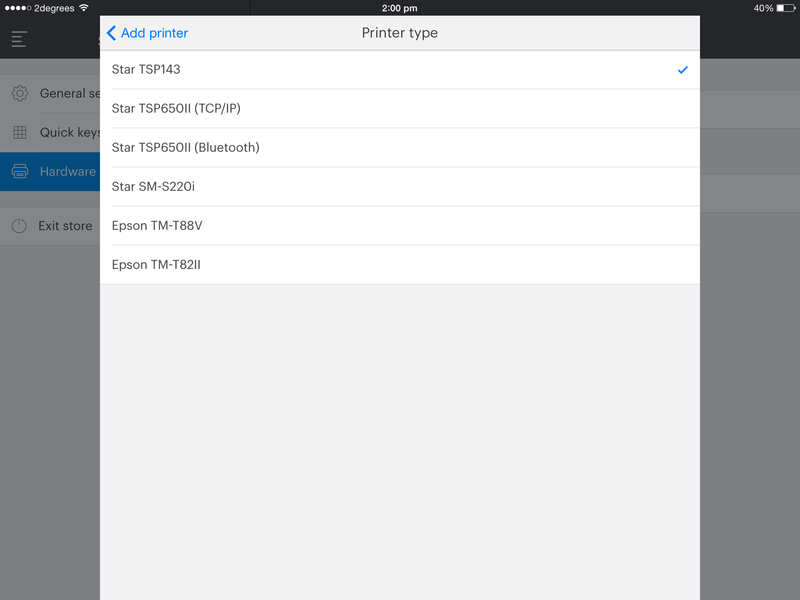 Configure the printer in the app. The SM S220i is a handheld portable printer, which is great for mobile stores. Alternatively, the 650 series is a countertop alternative, which is great for stores with a fixed power supply, but no ethernet. Both can only connect to one register at a time. Turn on 'Bluetooth' in the app settings. Tap the 'Bluetooth' option under 'General Settings'. Ensure Bluetooth is turned on. Type in the device PIN: 1234. For kitchen or barista printing, read the printing type section below. Connect your iPad to the WiFi network you'll be using. Plug the printer into the WiFi router (needs to be the one creating the network) using an ethernet cable. Hold down the 'feed' button, and turn the printer on. This will print two slips. The second slip will have the printer's IP address. If you're using either of the supported Epson printers, your setup will be a little more complicated. When you first buy an Epson printer, it won't be able to connect to your network. You'll need to change the network settings by configuring DHCP. This can be a bit scary if you're not very technical, so you might like to ask your IT support person (or friendly local geek) for help. DHCP needs to be set on a Mac or Windows computer. You can't do this on your iPad, as the printer needs to be plugged into the computer. Once it's set up, you'll need the test receipt with the IP address on it. If you don't still have this, press and hold the 'push' button. The printer will print out the network settings. Once you have set up your hardware, you need to connect to the Vend Register app. Tap the menu button in the top-left corner. The sidebar will open. 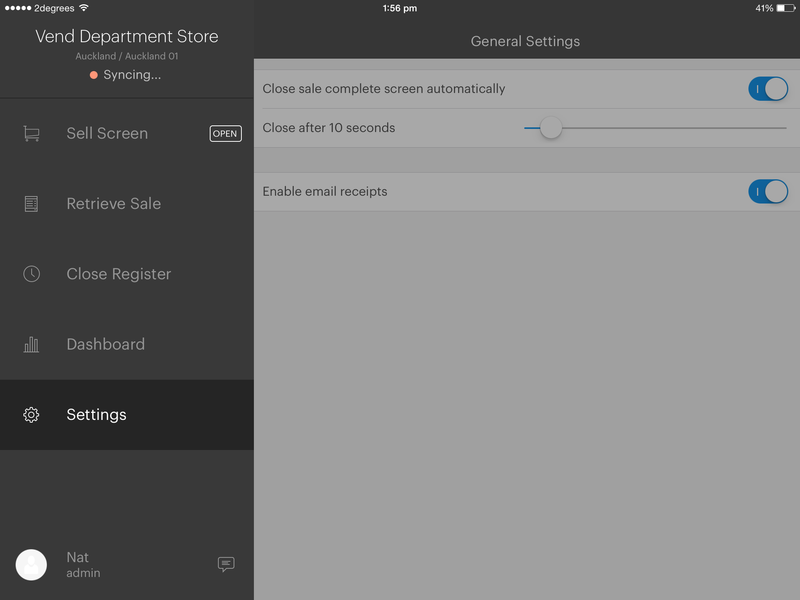 Open the settings menu in the Vend Register app. Tap printer model, and choose your model number. Enter the printer IP address. Follow the instructions below to obtain the IP address for the type of printer you've chosen. Note: the SM-S220i does not need this, as it connects via Bluetooth. Important: You do not need to add any information into the "Bluetooth Adress" field When setting up a Bluetooth SM-S220i or 650II printer. If you get a printer not found error, check and make sure that this field is empty. Once you've selected 'standard receipt', the printer menu will give you the option to customise your receipt header. This is the text that appears at the top of each receipt. Your store name will automatically be included. You can add basic styling to this by tapping the words to select them, and then choose the 'BIU' option. You can then choose to add bold, italic, or underline styling. Secondary receipts can be used to set up kitchen or barista printing - where you may only want to print some transactions, and even some products within some transactions, to each of their printers. You can have more than one secondary receipt printer, and each can have its own tag settings. To change to secondary receipt, tap the 'receipt type' field, and choose 'Secondary receipt'. A secondary receipt does not have a header or payment details. When printing to a secondary receipt, you can choose only to print items with a certain tag, for example 'coffee' and 'tea', or 'food'. After you set the receipt type to 'Secondary receipt', the 'Print products by tag' field will appear. 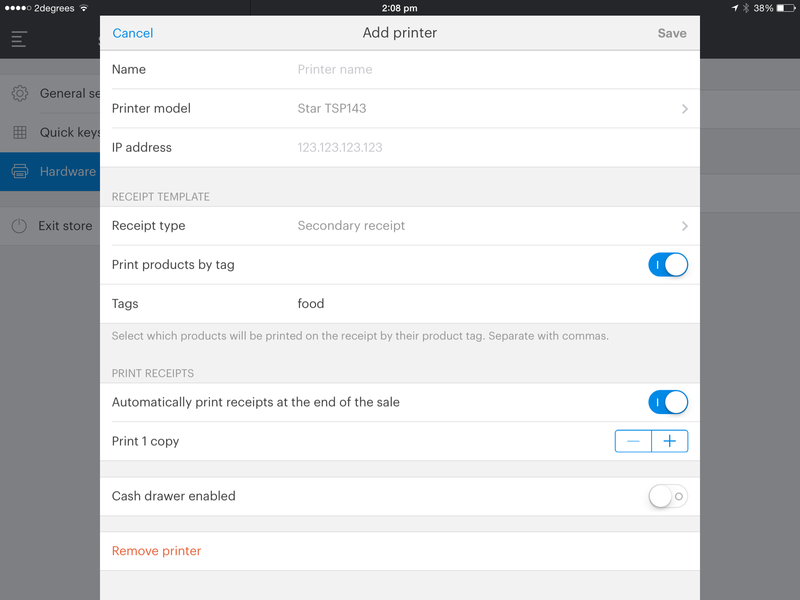 Turning on 'Print by tag' and specifying a product tag will cause a receipt to be generated by the printer ONLY when a product with that tag is included in the sale. Tap the button to turn it on. A new field will appear, called 'Tags'. You can add different product tags in here. Each tag should be separated by a comma. Set the 'Cash Drawer Enabled' setting to 'off' - you don't want to trigger the cash drawer for a secondary receipt. These tags must exactly match the tags you added when you set up your products. You can check these by logging into the Vend on Mac or PC, and clicking the products tab. You can then either look at individual products or use the 'tags' tab to see what you've already got set up. If you want to know more about setting up tags on products, read this article. Now, when you make a sale with a tagged product, this receipt printer will generate a receipt as well as your main printer. Hint: You can print both a standard receipt and a secondary receipt(s) to the same printer. Just add the same printer twice, and choose standard receipt the first time, and secondary receipt the second time. The printer will then print a full receipt, and the secondary receipt slip on applicable sales. You could tag all your coffee products in a café with 'barista' and all the items that need to be sent to the kitchen with 'kitchen'. When setting up the printer by the barista, you'd then turn on 'tagging enabled', and specify the 'barista' tag. When setting up the printer in the kitchen, you'd select the 'kitchen' tag. Kitchen printer - a receipt with only the eggs on toast so that the kitchen can prepare it. Select whether you'd like your receipts to be printed automatically. At the moment, if you don't automatically print a receipt, you won't be able to print one manually. *This is set for each printer, so make sure you've set all required printers to print automatically. *Number of receipt copies: *You can also choose to print multiple copies of the receipt for each printer. 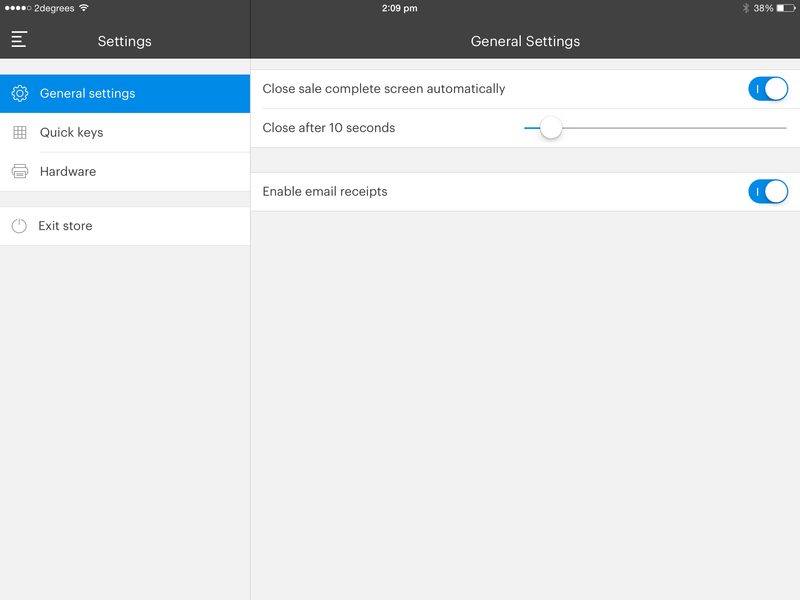 To turn on email receipts, click the menu button and choose settings. Tap 'General Settings'. To turn on email receipts, slide the button to the right, so it turns blue. Once you've completed a sale, you'll have the option to type the customer's email address in to send them the receipt. 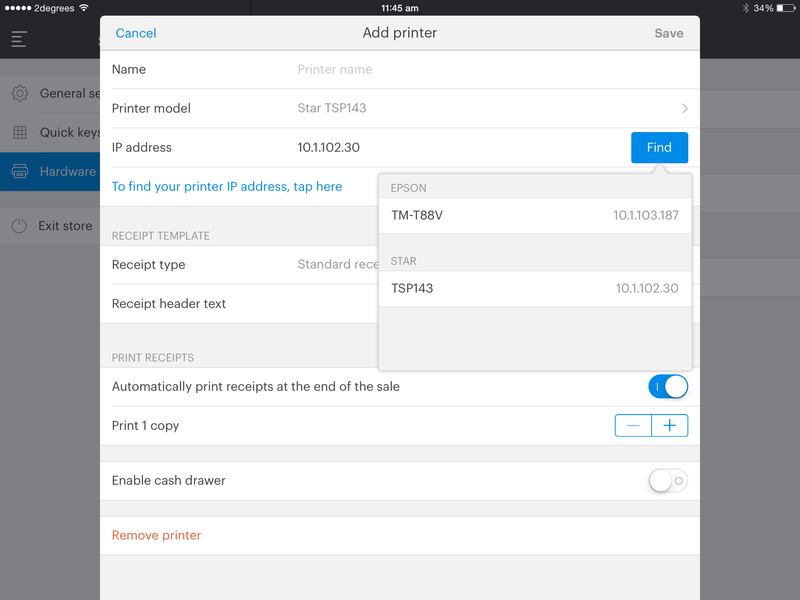 If you're using the Vend Register app with a non-handheld printer, you can set up a cash drawer. Vend Register supports any cash drawer that can connect to your receipt printer using an RJ12 cable. The cash drawer connects to your receipt printer and is triggered to open when you finish a cash or cheque sale, and the receipt is printed by the printer. A manager or admin can also manually open the cash drawer. You can configure one cash drawer per receipt printer. Tap the menu button to open the sidebar menu. Toggle the 'Open cash on sale' setting to 'on'. Repeat this for each cash drawer for each printer. Important: You must have at least ONE receipt printer with a cash drawer enabled to be able to open the cash drawer in the app. Smartpay is an integrated payment service for New Zealand retailers. 1 Smartpay terminal to 2 (or more) Vend registers. If both registers try to take payment at the same time, the terminal will queue the requests. Before beginning this setup, you'll need a Smartpay terminal. This will need to be set up to connect to your WiFi network. Once your terminal is connected to the same WiFi network as your iPad, hit 1 on the keypad. The IP address of your terminal will be displayed. Choose 'Dashboard'. The web browser version of Vend will open. Click 'Add Payment Type' and choose 'Smartpay' under Integrated. Tap the menu icon to open the side menu bar. Under 'Smartpay' Terminal, type in your terminal IP address. You can find this by pressing '1' on your payment terminal. Note: If you are using Smartpay payments, we recommend you leave the default 'credit card.' payment type set up on your account also, to enable you to record payments if your Internet connection is offline. You're now set up to take Smartpay payments. iZettle are a payment company who aim to make setting up and processing payments fast, secure and super simple. Using iZettle's secure card reader, you can process credit and debit card payments from the Vend Register app. iZettle has low payment processing fees - the fees are lower the more transactions you process, and it is simple to set up. Signing up for an iZettle account also gives you access to their free app, which provides you with reporting on your sales. The integration is only available on iPad. The minimum payment amount on iZettle is 1.00 unit of your currency, e.g. £1.00. iZettle accounts also have some daily payment limits. You can read about these here. The iZettle card reader does not have inbuilt receipt printing. If you wish to provide your customer with a receipt, you'll need to either use email receipts or use one of our approved receipt printers for the Vend Register app. Connect the iZettle Card Reader to your iPad via Bluetooth. You can find instructions on the iZettle help site here. You'll be prompted to download the iZettle app. Download this so you can access their payment reporting and refunds. In Vend Register, tap the menu button to open the side menu bar. Choose 'Dashboard'. Your Vend dashboard will open. Choose 'iZettle' and name the payment type 'iZettle'. Click Save. Tap the menu button to open the side menu bar. Tap 'Hardware' and select 'Login to iZettle'. Enter your iZettle account details and click 'Sign In'. You're now ready to start taking payments. Worldpay integrated payments are an integrated card payment provider. They're fast, secure, and easy to use. You can use them for the Vend Register app as well as Vend on your Mac or PC. If you've already set up Worldpay payments in your store, you don't need to set them up again. Just make sure you've assigned a terminal to the register you want to use, and they are connected to the same network. If you haven't set up Worldpay, follow the instructions here. This can be done on your iPad or a computer - on your iPad, just open the side menu, and select 'Dashboard' to open the Vend back-office and get started. Then, just follow the directions in the link above. Moneris Payments is an integrated payment solution for Canadian retailers. We have built an integration for the Vend Register app to make sure you can check out customers quickly and accurately. If you haven't set up Moneris Payments please follow the guide here. To follow these steps, you'll need to open the Vend Register app, click on the side menu, and select 'Dashboard' to open the Vend back-office. Once here, you can follow the directions in the link above. Please note that Moneris Payments are only integrated with the Vend Register app at this time. Tyro Payments are an integrated card payment provider. They provide payments for the Vend Register app, as well as Vend on your Mac or PC. You can use Tyro Payments on the road or in store. Each Tyro terminal can be paired with a single Vend register at a time. If you haven't set up Tyro payments in your store, follow step 1 below to add the payment type. If you've already set this up in your store, you can move straight on to step 2. In the Vend Register app, log into the store register you want to set up the payment terminal with. Under Dashboard, navigate to Setup - Payment Types. From the payment type drop down, choose 'Tyro' and give your payment type a name, for example 'Card' or 'EFTPOS'. Open the side-menu again and this time navigate to Settings - Hardware. Under 'Tyro', click 'Pair Terminal'. Navigate to 'Configuration' and open the 'Integrated EFTPOS' menu. Select 'Authorise POS' or 'Pair with POS'. A Merchant ID (MID) and Terminal ID (TID) will appear on the screen. On Vend, input the Merchant ID (MID) and Terminal ID (TID). Click 'Authorise'. Wait a few seconds, then hit 'start' on the terminal. This will pair the Tyro terminal with your Vend account. Click 'OK' on the popup message in Vend. You can also choose to print your Tyro payment receipts via the inbuilt Tyro terminal printer or print them with your regular thermal printer. This setting only applies to EFTPOS receipts, not your normal Vend receipts. You can toggle this on and off from the Settings - Hardware screen in Vend. Your terminal is now set up and ready to go! If you would like to test the payment settings, edit the payment type and click the 'configure Tyro' link again. Choose 'I know what I'm doing', and click the 'Test' button. Paypal card payments are available in the US. To set up Paypal payments with your store check out this article here. For added security, you may like to turn on Apple's Guided Access feature on your iPad. This restricts access so that your staff can't access or download other apps on your iPad, keeping them focussed on serving your customers, rather than playing the latest games! If you're not going to be on-site all the time, you may like to ensure your shift manager has access to the Guided Access PIN number in case any hardware like barcode scanners need to be re-paired with the Register app. To turn on Guided Access, check out Apple's instructions here. You're now ready to start making sales!